Three weeks ago, we brought you the story about Trayvon Martin's death when it was an early local issue. Since then the story has made national, even international headlines. The Reverend Jesse Jackson flew in and Friday the Reverend Al Sharpton called for 'action' and a boycott. Our local NAACP has declined Sharpton's 'action' and boycott, thank you very much. We have a new prosecutor, the 11-month police chief stepped aside, and a majority of folks– including white folks– believe Trayvon Martin was terribly wronged. Here's what most people don't know: Someone other than George Zimmerman is ultimately responsible. To be sure, radio wing-nuts assert we don't know how frightened and brave Ward Captain Zimmerman was to face an unarmed kid, and a gun group is advertising a George Zimmerman defense fund. Zimmerman's father claims we don't know all the facts and Zimmerman's brother made wild accusations that Martin grabbed the pistol and screamed "Tonight you die," which doesn't seem to fit known facts. We learned Zimmerman's magistrate father may have intervened on the side of his son in earlier arrests. Worse, far-right sites such as StormFront have taken to defaming the teenager, falsifying photos and a police record. Yes, Trayvon was tattooed– with praying hands and a tribute to his grandmother. In contrast, Trayvon's brother appeared level-headed and honest to a fault, saying he couldn't be certain if the screams heard on recordings are Trayvon or not. For the record, the Orlando Sentinel hired experts who, using two different technologies, demonstrated the screams weren't Zimmerman's. I'm not here to demonize the shooter, much as I believe he caused a tragic death. Although Sanford's police department has had problems, I'm not sure we can focus blame on police. Why? If prosecutors refuse to prosecute, how can police jail the accused? And according to detectives, police wanted to arrest George Zimmerman but prosecutors refused. Certainly investigators made mistakes, beginning with not dispatching a homicide detective to the scene and accepting the word of George Zimmerman without question. They did not test Zimmerman for drugs or alcohol, violating standard procedure. They uncritically accepted recorded screams were the killer's, not the victim's. They stated neighbors' stories conflicted with 'known' evidence. They refused to release the 911 calls until forced to by attorneys. But in the end, their hands were tied. Why? You're about to find out. I'm going out on a limb and say another man is more responsible for not only Trayvon Martin's death, but the murder of dozens of other Floridians. This man's name is Durell Peaden of Crestview, Florida, a former state senator, the genius behind 776.013§3 that gives Floridians the right to kill with virtual impunity, a law that tripled the number of 'justifiable homicide' killers set free, jumping from an average of thirty-four a year to more than a hundred. The lobbyist behind the law was NRA's Marion Hammer who argued Floridians needed more than a right to carry a weapon, they need the right to use it pretty much at will. In 2005, our Sunshine State pioneered a law called 'Stand Your Ground', also called 'Never Retreat', 'Shoot First', 'License to Kill' and, according to Tallahassee State Attorney Willie Meggs, 'that stinking law'. This testosterone-powered statute supplanted the common (and sensible) 'castle doctrine', which gave people the right to defend their homes. Sneering at what they called 'the Brady bunch', the NRA claimed the new statute was needed to prevent authorities from harassing law-abiding citizens with petty arrests. It's not a 'pro-gun' law nor are the law's opponents anti-gun, although politicos on both sides may argue otherwise. The new statute legalized an aggressive never-back-down philosophy. It says you don't have to walk away from a confrontation. It says you have the right to solve problems with a gun or a baseball bat or a knife or an ice pick. With impunity, it allowed a man to kill another in a playground argument over a skateboard– literally. It allowed a homeowner to legally shoot an inebriated man who knocked on the wrong door and asked for a light. Alcisviades Polanco walked after fatally stabbing another in the head with an ice pick. Numerous avoidable bar fights have needlessly ended in death… and without penalty. Six months ago, Judge Richard Oftedahl of the 15th Judicial Circuit dismissed all charges against Michael Monahan, charged in a double homicide and facing the death penalty. Monahan walked after shooting two unarmed men from a distance of twenty feet, men who never laid a hand on him. This bill was strongly opposed by law enforcement, prosecutors, liberals and conservatives alike, although it appealed to excitable wing-nut elements. Since its inception, as many as twenty-four states copied it. Its first five years saw nearly a hundred claims of use with more than two-thirds resulting in death. The vast majority of these homicides were excused by prosecutors or, in cases where prosecution actually occurred, given a pass by the courts. Those favoring the law declare it a great success with fewer people clogging the courts. Victims like Trayvon Martin might argue otherwise. Many of the cases have only two witnesses… one who winds up dead. Police and prosecutors tried to warn legislators about the predictable effects of the law, but lawmakers blew off their concerns, seduced by NRA donations and that exciting chance to kill a human being. Sadly, they're not the ones paying the price. For the record, if you think I'm letting George Zimmerman off the hook or if you think I'm opposed to gun ownership, then you've misread the article. What I'm for is common sense which is sadly missing in Florida. One more small thing bothers me. In researching this article, I came across two cases in which Florida courts disallowed the Stand Your Ground defense. In both of those cases, the shooter happened to be… black. good post. I'm convinced that much of our obsession with guns and gun 'rights' comes from fear and from our lamentable history of racism. It's a fact gun owners are more responsible than most citizens was why the law passed. We don't know what happened and all else is guessing. The last paragraph is indeed disheartening. As much as I want to believe that legal decisions are based on evidence, etc., this sadly disproves that. In my lifetime I have seen strides toward the abolition of racism. But I fear it will always be around. Unfortunately it cannot be legislated. Janice, it's clear we've a way to go before we can declare racism behind us. Anon, we do know quite a bit from the 911 calls, ear witnesses, and analysis of the recordings. Personally I think it's a mistake to tie this bad "Shoot First / Stand Your Ground" law in with gun legislation… it's simply a bad law. Herschel, I agree. The overt racists will always be with us, but I'd like to think we'll win over those who simply cannot see. Colorado has a "Make My Day" law, but it only applies to defending yourself at the home, and appears to have common sense involved. Time will tell. However, I'm not very comfortable with some of our state legislators who are trying to pass a bill to allow handguns on state university campuses as a reaction for previous shootings on various campuses. That sounds like a recipe for even more disaster. Anon:interesting argument. Can you give us a link to your evidence? In Washington state, where I live, in recent weeks we have had three cases (two fatal) of children being shot by other children, all of whom had gotten hold of guns their parents owned legally. One of the gun owners was a police officer. On the other hand, last night a man killed a stranger who broke into his apartment. I have no problem with that; my problem would be if the gun owner followed the man outside and shot him. A sad and sobering read. Here in Tennessee, some legislators have advocated allowing guns on school grounds and allowing teachers and administrator to carry guns in school. They are currently debating allowing patrons in bars to keep guns in their cars in the parking lots. The bar owners oppose it. I wonder if the kid would have been arrested if he had managed to take the gun from Zimmerman and shot him? Another feature of this case - and a probable explanation of much of what happened - is that Richard Zimmerman, George Zimmerman's father, is a retired judge. I've worked for a couple of judges in my life, and while most express integrity and probity, they all receive (sometimes without their even realizing it) special treatment from law enforcement, lawyers, and anyone else who might show up in court with them. (That standard crap in movies/TV of lawyers yelling at judges never happens in real life. Or if it does, the lawyer's going to jail.) Judges have a lot of connections, clout, and are often willing to use it to keep their loved ones out of jail, no matter what they've done. Once I found out that Zimmerman senior was a retired judge, everything fell into place: that's why George got away with shoving a cop; why the police originally said he had a clean record; why he wasn't tested for drugs/alcohol, and why he wasn't and hasn't been arrested. You need to have smoking guns to mess with judges' kids. And even then, there will probably be some strings pulled. RT and Louis, when I hear folks say they think the laws of the Old West should apply to gun ownership, they seem to forget the rules of Tombstone and other towns was you parked your guns at the marshal's office before you wandered off. Campuses and bars aren't sensible places to pack heat. Rob, when my cousin was little, he found his father's Navy Colt and shot a hole through the ceiling. Even when we were small, we knew where Dad kept his rifles, which I'm sure he thought were well tucked away. Eve, that makes a lot of sense and explains much. No wonder Zimmerman got away with punching a cop. Sanford has an unpleasant bit of history. In 1946 when Jackie Robinson and was playing AAA ball and the team was wintering in central Florida, Sanford's sheriff threatened to shut down baseball if Robinson set foot on the diamond. The manager felt so threatened, he sent Robinson and his wife to Daytona for safety. That wasn't a proud moment. Ann Coulter and Laura Ingraham called the case a hoax hate crime. Bill Kristol wasn't as hateful as the women, but he suggests same thing you say, that the law is at fault. Here in Florida, we've seen both sides trying the case in the press. 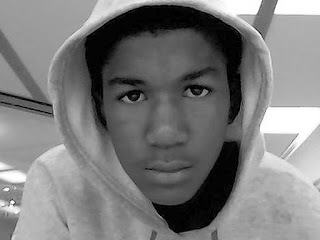 Some radio and television are broadcasting statements by Zimmerman's father and brother as fact, claiming Trayvon wasn't running away, but was the aggressor. Despite the rhetoric, one thing appears clear: An innocent unarmed boy was shot. Zimmerman's attorneys, while claiming they are no longer in touch with Zimmerman, have taken matters a step further by claiming Trayvon committed battery upon George Zimmerman.